This course is currently in development. Below is a description of what I plan to finish in the next few months. If you register for the course now, your subscription will last 36 months (instead of 24 months) as course content will be added on a gradual basis. .
FastMath teaches flexible techniques for fast and efficient mental calculations. FastMath is different from other mental-math resources because FastMath focuses on practical, everyday calculations, FastMath emphasizes understanding of the fundamental math principles involved instead of memorizing specific mental-math methods, and FastMath teaches how to solve quantitative problems in the most efficient and simplest manner. FastMath teaches methods for calculations using pen & paper, and pure mental calculations - useful in any situation where you can’t use or don’t have a calculator or a computer. Watch the promotional video to see examples of the FastMath techniques in action. FastMath will benefit anybody who wants to improve their mental-math skills: from junior high school students, to working professionals, to retirees. Recommend for ages 12 and up. FastMath will briefly review these concept topics, and teaches students how to be more efficient with these operations, but doesn’t teach these concepts from scratch. It’s OK if you aren’t fully comfortable with these topics, as long as you have seen them before. If you have taken (or are currently taking) an introductory Algebra course, you have sufficient math skills. Advanced middle school students (11-12 years old) may also benefit from the course. You do not need to have taken Statistics, Probability or Calculus. 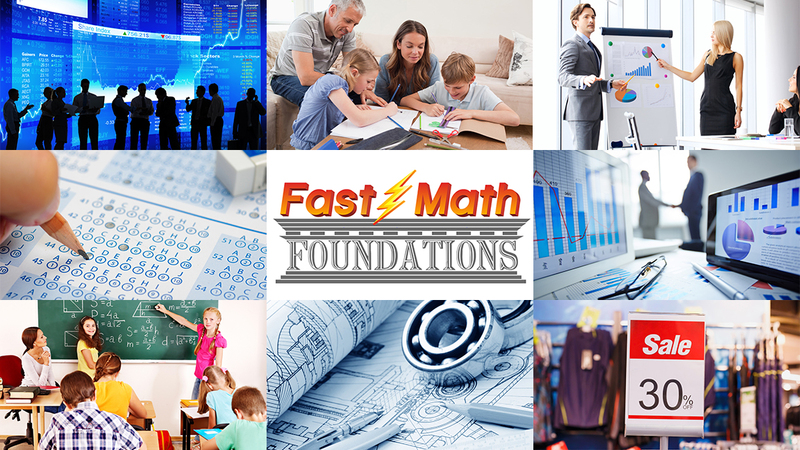 If your child is 10 years old or younger, they may not benefit from the FastMath course unless they have very strong math skills.